Flexible software, it’s something that many software companies only talk about. Can their software adapt to changing conditions related to HMRC digital revolution, GDPR & Brexit? Is there a charge for their upgrades? Do your changes need to be re-written with each software update? 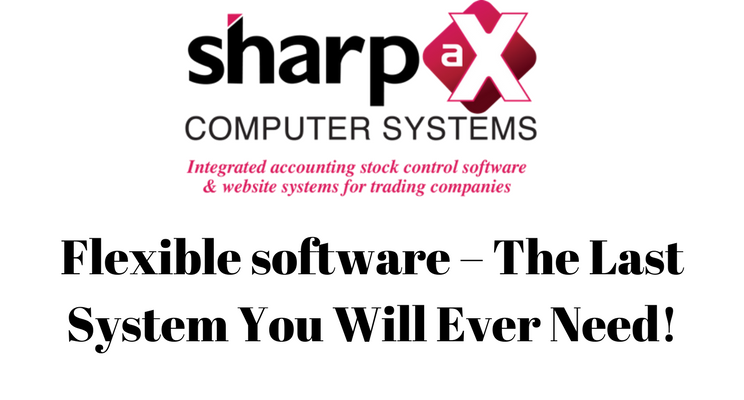 At Sharp-aX Computer Systems our software offers unparalleled real flexibility. The Sharp-aX software can be tailored to your business needs. Add fields, tables and filters with a few clicks quickly and simply to ensure that the Sharp-aX software works to support your business your way and not be told how it must be run. Our knowledgeable implementation and support teams can advise on how best to setup the software, sharing a wealth of ideas from other companies on how to simplify your processes. We also have a full team of development staff who are continually watching the market place and pushing all boundaries to ensure that you stay ahead of your competitors. Further flexibility is demonstrated whereby we provide integrations with specialist tools such as Sales-I, Aspin, Toolbank and many others to ensure that your Sharp-aX system will stay with you for the lifetime of your business. Utilising our Web API and Publisher modules, we are able to simply and easily send the necessary data to third party systems, as well as receive updated information keeping your Sharp-aX software solution where it should be, at the heart of your business. Sharp-aX Managing Director Jean Freeman commented: “We know that our customers and their businesses are not standing still. “New opportunities, products and markets appear and our customers’ business software must be able to adapt and change accordingly.